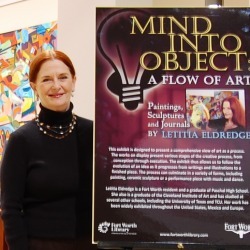 Letitia Eldredge's lifetime of commitment and dedication to art has led to the mastery of several different media. Well known for her masks and original paintings in gouache and oil, she has created a unique style resulting in dramatic figurative concepts that evolve from clay and canvas to dance design and performance art theater. Her ideas are poetic and passionate, imbued with humor and eroticism. She tells an intimate mythological human story configured as conceptual symbolism. Hers is an intuitive exploration of emotional and philosophical insights that connect her world to an ancient archetypal resource of inspiration. Through dreams and an underpinning of creative writing, Letitia examines her culture, milieu, and existence with a spiritual dedication. Letitia began her art education at Sophie Newcomb College, but soon returned to Texas to attend University of Texas at Austin. There she met with two influential professors: Charles Umlauf, notable Texas figure sculptor, and Vincent Mariani. It was Mariani who corresponded with her along more conceptual lines of inquiry. Mariani also put the challenge and opportunity in place for her attendance at Cleveland Institute of Art. This venue put her talents in the way of extraordinary modern artists and focused her early career toward New York and international collaborations. In 1968, Letitia's ceramic art was collected by the Cleveland Museum of Art. In 1973 she debuted her very original, performance art with ceramics and masks, before a select audience of MOMA trustees, ushering her on stage at LaMama ETC in New York City. By this time, Letitia had come into contact with Thomas Messer, then director of the Guggenheim Museum of Art, who put his support behind her ideas with various critiques and introductions. With this production and Hotsun Company she subsequently toured 5 Texas museums. She made her way on to debut in Paris at Theater D'Orsay (1974) in response to a special invitation from Jean Louis Barrault. In 1976-1978 she received the NEA Expansion Arts Grant then returned to Paris for the International Communications Agency. She was guest artist for Festival d'Autome at Centre Americain (1980). Letitia is a MacDowell Colony Fellow, a Franklin Furnace Archive alum and recipient of several research and teaching Fellowships including the Franzheim Synergy Trust. She has had many one-woman exhibitions including: the Denver Art Museum; The Institute for Diplomatic Relations in Kiev, Ukraine; Museum der Kurnst, Vaduz; Liechtenstein; Gallerie Alexander Iolas, Paris. Letitia has enjoyed a teaching and lecture series at The University of the Americas, Puebla, Puebla Mexico; the Instituto de Allende of San Miguel; University of Nice, France; Mesa State College, Colorado; University of Houston; Rice University and Texas Christian University. In 1997 she worked as artist- in-residence with NeoSoft.com, Houston. While there Eldredge exhibited with Paschal Robinson Galleries. Her experience with technology brought about the compilation of her varied concepts for future online/film communication and providing the impetus for her art today. A Fort Worth native, Letitia performed throughout(1985-1987) as studio visual artist in residence at Caravan of Dreams. More recently, after 4 years mountain studio time in Colorado, she returned to Texas to create. November 2009-January 2010, the Fort Worth Library presented "Mind Into Object: A Flow of Art", curated by Tom Kellam, archivist and historian for the City of Fort Worth. This exhibit explored Eldredge art from an archival perspective. Kellam included original manuscripts along with her developed art. His expressed intention points to the artist process of idea evolution linking through literature and imagery themes. Ukraine Institute for International Relations, Kiev, Ukraine. De Menil Foundation, Houston, Texas. New York Health and Hospital Association, New York, New York. La Mama ETC, New York, New York. Fort Worth Modern Art Museum, Fort Worth, Texas. Dallas Museum of Fine Art, Dallas, Texas. San Antonio Museum Association, San Antonio, Texas. Fort Worth Library Archives, History and Geneology, "Letitia Eldredge Papers"
Texas A & M University, College Station, Texas. Smithville Texas Historical Society, Smithville, Texas. Sheraton Hotel, Salt Lake City, Utah. Lander's Machine Shop Gallery, Fort Worth, Texas. 2008-09. Art World Galleries, Los Angeles, California.1989-1992. Fort Worth Gallery, Fort Worth, Texas.1986 and 1989. Sogher Leonard Associates. New York, New York.1986. Watson de Nagy, Houston, Texas.1980. Caroline Lee, San Antonio, Texas.1978-1980. Betty Cunningham Gallery, New York, New York.1977. Galerie Alexander Iolas, Paris, France. Murray Smither Gallery, Dallas, Texas.1972-1978. Harriet Mouchley-Weiss Collection, New York. Mimi Poser Collection, New York. Sr. & Sra. Pablo Maurer Collection, Puebla, Mexico. Sr. Gabriel Alatriste Collection, Puebla, Puebla, Mexico. Senorita Anna Paola Maurer Collection, Mexico City, Mexico. Mr. & Mrs. Sid Bass Collection, Fort Worth, Texas. Mr. & Mrs. Ed Bass Collection, Fort Worth, Texas. Mr. & Mrs. Robert Bass Collection, Fort Worth, Texas. Mr. & Mrs. Lee Bass Collection, Fort Worth, Texas. Mrs. Ann Hendricks Bass Collection, Aspen Colorado. John E. Langdon Collection, Fort Worth, Texas. Mr. & Mrs. Larry Boetiggheimer Collection, Arlington, Texas. Mr. & Mrs. Tom Kellam Collection, Fort Worth, Texas. Attny. & Mrs. David Broiles Collection, Fort Worth,Texas. Mrs. Caroline Dulle, Fort Worth, Texas. Peter Feresten Gallery Collection, Dallas, Texas. Judge & Mrs. Neel McDonald Collection, Fort Worth, Texas. Joanna Harcourt-Smith Collection, Santa Fe, New Mexico. Carolyn Cook Collection, Santa Fe, New Mexico. Mr. J. J. Meeker Collection, Santa Fe, New Mexico. Susan Roth Collection, Dallas, Texas. David Stark and Patricia Brown Collection, Austin, Texas. Dr. & Mrs.Charles Langham Collection, Fort Worth, Texas. Mr.& Mrs.Robert Allen White Collection, Dallas, Texas. Mrs.Whitney Hyder Moore Collection, Fort Worth, Texas. Russell Tether Fine Arts Collection, Dallas, Texas. Mr. & Mrs. Randall Young Collection, Houston, Texas. Mr. & Mrs. Karl Lehenbaurer Collection, Houston, Texas. Mr. Will Pascal Robinson Collection, Houston, Texas. Mrs. Marilyn Oshman Collection, Houston, Texas. Mr. Jeffrey Allan Basinger Collection, Fort Collins, Colorado. Mr. Arthur Powers Collection, Denver, Colorado. Fort Worth, Texas. November 17, 2009-January 15, 2010. River Walk,Trinity River Perspectives, Fort Worth Community Art Center, Group Invitational. Exhibition and Solo Performance, Fort Worth, Texas. September-October 2009. ARTX2, Metaxia White Presents Letitia Eldredge and Ronald Watson, Fort Worth, Texas, December 10-17, 2006. A Day in the Life of a Woman; WOMEN'S HISTORY MONTH 2006. Central Fort Worth Public Library, March 4-March 28, 2006.Group Exhibition. Out of the Blue. Pascal Robinson Gallery, Solo Exhibition with Mask Performance Art. Houston, Texas. 2001. Mind Into Object, IC2 Institute, Mind Into Object, Solo Exhibition, RGK Foundation; University of Texas at Austin, Texas.1997. Letitia Eldredge Art, Capitol City Playhouse Gallery, Solo Exhibition. Austin, Texas. Full Season 1996. Leititia Eldredge Masks, Universite de las Americas, Solo Mask and Performance Exhibition. Puebla, Puebla, Mexico.1994. Mandalay Festival of Arts; Festival Designer, Produced by Main Events International , Las Colinas, Texas. (Wins 2nd Place Award, Edinborough Festivesign Competition) 1994. Why Hanna's Skirt Won't Stay Down, La Mama ETC., Set Designer. Script by Tom Eyan.T & T Productions. New York, New York.1994. International Nexus, Group Painting Exhibition, Franzoni International; Trammel Crow Center. Dallas, Texas. June,1992. Art Sail: Maiden Voyage, Exhibition, Austin Yacht Club, Lake Travis, Austin, Texas. June 9,1991. Fort Worth to Indonesia, Caravan of Dreams Performing Arts Center, Sister Cities Conention. Solo Mask Exhibition with ensemble performance directed by Jill Posner, Fort Worth, Texas. 1990. The Faces of Destiny. Texas A & M University, Solo Exhibition; Benz Gallery. Bryan, Texas.1990-91. The Arts of Letitia Eldredge, Mesa State College, Johnson Gallery. Solo Exhibition with Ensemble Mask Dance Performance. Grand Junction, Colorado.1989. Letitia Eldredge. Brookhaven College, Solo Exhibition. Dallas, Texas.1988. Linclon Center, New York State BVA; Business Volunteers for the Arts; Sybil Simon Appreciation Awards Jewelry Designer. Presenter: Kitty Carlilse; New York, New York,1988. Letitia Eldredge at Caravan of Dreams Performing Arts Center, Solo Exhibition, Fort Worth, Texas. September 25 through November 1, 1985. Rita Jackson, Genevieve and a Sour Black Sheep, Denver Art Museum, Group Exhibition. Mask Duet Performance Art with Maya Basinger. Denver, Colorado, 1983. Texas Landscapes, Austin Museum of Art, Collaborations, Letitia Eldredge Masks with Texas Landscape Photography by David Stark, Austin, Texas.1982. Letitia Eldredge, Robert Stefanotti Gallery, New York, Solo Exhibition, October, 1981. Houston Museum of Fine Arts, Invitational Group Exhibition. Solo Performance Art. Houston, Texas.1979. Mondale Southwest Invitational, United States Vice-Presidential Mansion, A Classical Texas Landscape Sphere, Sculpture.Group Show, Walter and Joan Mondale Selection, Washington, D.C.1978-1979. Mind into Object, Fort Worth Modern Art Museum, Solo Exhibition and Performance with Masks. Sponsored by Elmwood Art Foundation. Guest Speakers: Psychologist: Dr. Albert Scheflin, Anthropoloigist: Dr. Robert Armstrong. Fort Worth, Texas.1977. Letitia Eldredge Masks, Museum der Kurnst, Solo Mask Exhibition and Performance Art, Vaduz, Liechtenstein.1975. Miss Turner's Audition for the Part of the Spider, Dallas Museum of Fine Arts, Solo Exhibition with HotSun Productions Ensemble. Dallas, Texas.1975. Theatre Odeon, Group Mask Invitational Exhibition, Paris, France.1974. Is This the Way Home?, Gallerie Alexandre Iolas, Solo Mask Exhibition and Performance Art with Veronique Scholer, Paris, France. July 26,1974. A Transcontenintal Funk Landscape, Cooper School of Art Gallery, Solo Sculpture Exhibition. with Performance Art Cleveland, Ohio.1970. May Show, Cleveland Museum of Art, Group Exhibition; Best of Show Award, ceramic sculpture. Cleveland, Ohio.1967.